Description: Come explore how to implement real-world data from Latin America into any classroom! 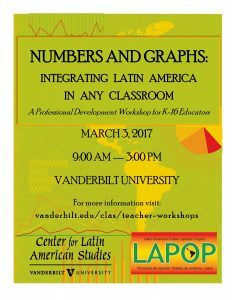 CLAS is partnering with the Latin American Public Opinion Project (LAPOP) to bring public opinion data in Latin America to your classroom. Through years of polling in most of the countries of Latin America, LAPOP has developed a treasure-trove of databases of public opinion information about varying viewpoints across Latin America. LAPOP is the leader in cutting-edge methods and best practices in research on opinions and behaviors with respect to democratic governance, economic well-being, health, security, education, etc. Dr. Mariana Rodriguez will introduce teachers to LAPOP’s methodology, data collection process, and ways to access and bring the data right into your classroom. Stephanie Knight will share Parable of the Polygons, a hands-on tool that can be used to address bias and diversity. Teachers from Hillsboro High School will share how they used LAPOP data to plan and teach an interdisciplinary PBL unit on Social Justice in their Spanish, Math, and History classrooms. 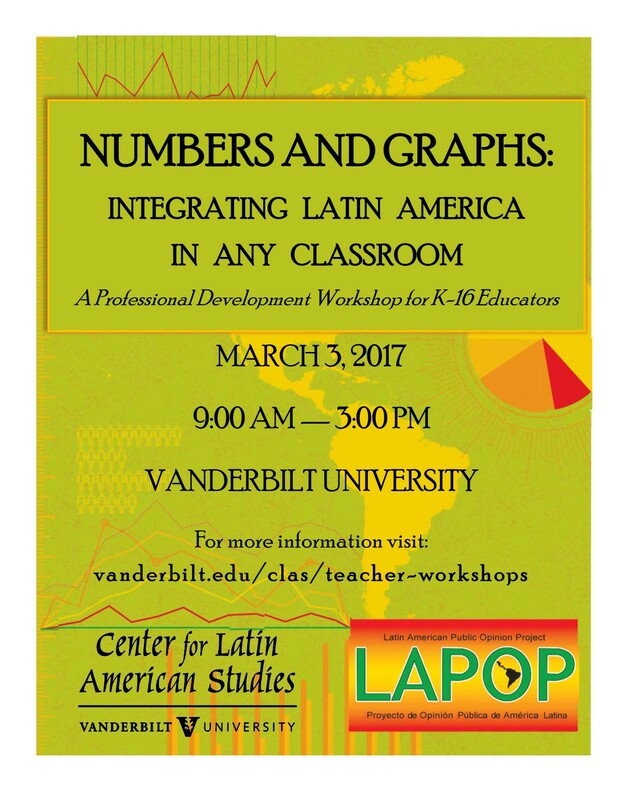 Math experts and Social Studies teachers alike will find value in LAPOP’s data and discover interdisciplinary ways to bring Latin American content to your classroom!